The Metadata Editor view allows you to view and modify the information for props and anchors when creating a game character or asset in Harmony. 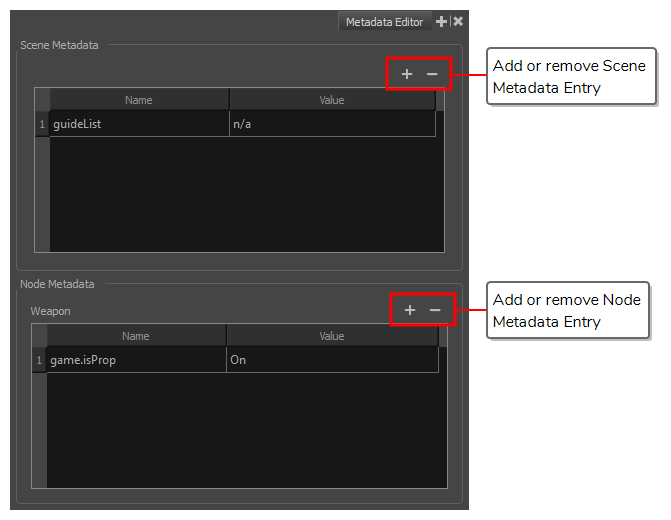 It displays your scene's metadata as well as the metadata for the currently selected layer and allows you to add, remove or change the value of metadata nodes. Usually, you do not need to manually add or modify metadata for a game character or asset using the Metadata Editor. The commands available in the Game toolbar can be used to define props and anchors, which will automatically fill your scene and layers with the proper metadata. The Metadata Editor is however useful for visualizing the way Harmony stores this information, to tweak it as necessary and to debug any issue that could occur when exporting a game asset to Unity. IMPORTANTYou should avoid using any character but letters, numbers, dashes and underscores in the Metadata Editor. NOTEFor more information on making game assets in Harmony, see About Gaming . In the top-right corner of a view, click the Add View button and select Metadata Editor. In the top menu, select Windows > Metadata Editor. Displays the metadata for the Harmony scene. Each entry has a name and a value. guideList This is a node in which the guides created in the Guide View are stored. This can be ignored—see Guides View. Displays the metadata for the currently selected layer. Each metadata entry has a name and a value. game.isAnchor When set to On, this sets the selected layer as an anchor. This means that, in Unity, the layer's pivot will be an anchor to which props can be attached. A prop will follow its anchor's movement. game.isProp When set to On, this sets the selected layer as a prop. In Unity, a prop can be attached to an anchor to follow its movement. game.<metadata name> When a layer has the game.isProp property, you can add any metadata node to it provided that the name of the metadata node starts with game followed by a period (.). This metadata will be exported to the list of metadata values for the prop, which can be used in Unity.